Aeromexico is an integral part of Delta’s success in Mexico, and their relationship is one of Delta’s pillars for success in Latin America and the Caribbean. This past year, Delta and Aeromexico carried over 7 million customers to and from Mexico"”enough people to fill the Azteca stadium in Mexico City 80 times over. Customers can also expect enhanced flight offerings as the JCA expands its presence, including a new service to Mexico City from Portland and Seattle, new flights to Merida and Queretaro from Atlanta and Delta’s re-entry into the Los Angeles-Mexico City market, increasing to 7 daily flights in the top transborder market thanks to the JCA. Delta has been investing in customer experience for several years, keeping its travelers at the center of its service goals. Delta refined its onboard premium dining experience in Mexico with a chef-created menu, using local ingredients to appeal to Mexican travelers’ preferences. Customers flying in Delta Comfort+, Delta’s premium economy service, can enjoy priority boarding and assigned luggage space for their carry-on bags. Other product initiatives being rolled out across Delta’s international fleet include the expansion of its Wi-Fi service and its free onboard entertainment system via Delta Studio. 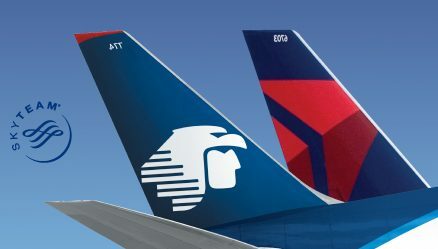 Through the Delta-Aeromexico JCA, the airlines now offer the Mexican market flights to the United States through Delta’s hubs in Atlanta, Detroit, Los Angeles, Minneapolis-St. Paul, New York, Salt Lake City and Seattle. Meanwhile, Aeromexico offers greater access to Mexico through its hubs in Mexico City, Monterrey and Guadalajara. In 1994, Delta and Aeromexico signed a commercial cooperation agreement, and in 2000, they became the founding partners of the SkyTeam Alliance. In 2006, both airlines jointly signed the maintenance services agreement (MRO in Guadalajara). During 2011, Delta invested million in Aeromexico (4.17 percent of shares).